With Honours Degrees in Engineering and Law, Mr. Justice Ivor Archie was called to the bar of Trinidad and Tobago in 1986. 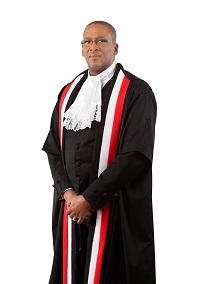 In 1998, while serving as Solicitor General of the Cayman Islands, he was appointed to the Trinidad and Tobago High Court Bench and was elevated to the Court of Appeal in 2004. In 2008 he became the 8th Chief Justice since the country’s independence and the youngest ever appointed to that office at the age of 47. In 2013 he was awarded the order of the Republic of Trinidad and Tobago, the highest national award. Chief Justice Archie is a Fellow and Board Member of the Commonwealth Judicial Education Institute, a Fellow of the Chartered Institute of Arbitrators and a certified mediator. He is married to Denise Rodriguez-Archie, a chartered accountant and they have two children, Chinyere, a medical doctor, and Sean who is an Engineer.